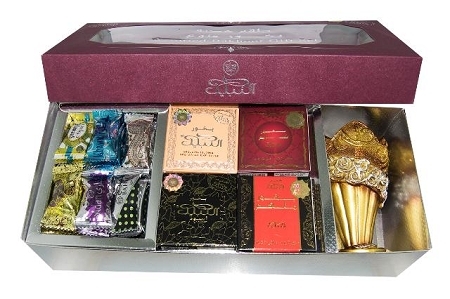 Bakhoor Incense Gift Set by Nabeel-- 4 x 40gm Bakhoors, 36 x 3g mini Bakhoors and a Beautiful Incense Burner all packed a beautiful gift box. Makes a wonderful gift or purchase this for yourself. An excellent value. Deep and Intense, Oudh and bakhoors is crafted from the fragrant resin, harvested from the heart of the knotted Aquilaria tree. It is traditional to burn incense in the house and outside as it adds a beautiful fragrance to the dwelling. Take a piece of burning charcoal and heat a corner of it with a small flame(lighter/ cooker) for about 60 seconds until it becomes red hot. I was first introduced to Bakhoor incense a while back by a friend and I am absolutely in love with it. For a while I only used Bakhoor Nasaem, but was interested to see what other scents they make. The sampler box is exactly as described and arrived quick. Its a wonderful gift to anyone who uses incense. 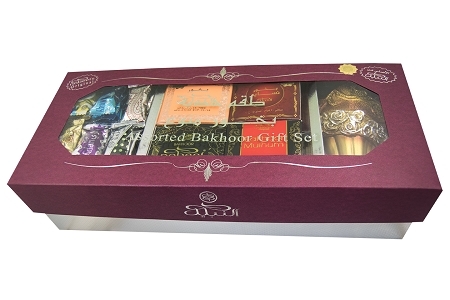 I ordered 2 bakhoor gift sets and was very pleased at Al-Rashad's service. The gifts were exactly as pictured, delivered promptly, and the recipients were delighted. I would not hesitate to place orders with this company again.